An elementary school like izakaya Japanese style dining bar, “roku nenn yon kumi (sixth grade classroom four)” operates six locations in Japan; four in Osaka, one in Fukuoka, and one in Tokyo. 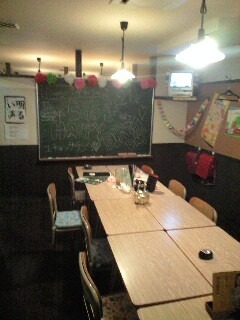 Inside of the izakaya is decorated with randoseru school bags, black board, and children’s drawings. There are private rooms themed “music room,” “principal’s room,” “library,” “teachers room,” “school infirmary,” and gives the guest the feel of going back to classic elementary school. Their menu also sticks to school theme serving classic school lunch favorites and experimental cocktails which the “students” mix their drinks with test tubes and flasks. The waiters are in jersey just like teachers, and they give pop quiz sheets to all the “students.” Those who got all answers right can get rewards! 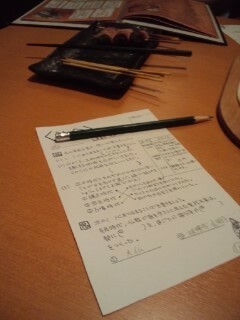 This izakaya is perfect for class reunion. It might be fun experience for foreign tourists to visit.